that doesn't mean I haven't been crafting and reading my favorite paper blogs. 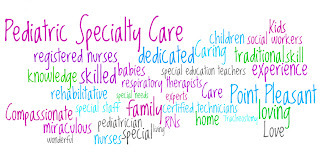 This morning, for instance, one of my favorite bloggers Diane at Capadia Design wrote about an a-m-a-z-i-n-g website called Wordle. You enter or link to a series of words and then based on your use of those words and the "weight" you give them, Wordle randomizes them and creates a layout featuring those words. I could (and did!) play with this for hours. 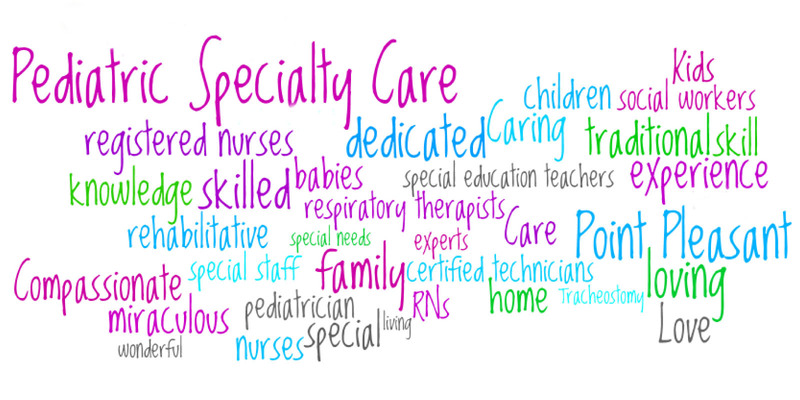 The layout above is one that Wordle created for me using the words I associate with my new job in the SNF for medically-fragile children, Pediatric Specialty Care at Point Pleasant. Wouldn't this look cool on a t-shirt, or notecard?! Oh, the possibilities are endless! Go play with your own words but be forewarned, you'll be playing for a long, long time! So cool! I will give it a try, thanks for passing it along. That is cool Ellen thanks for sharing. I'm going to go play. I saw this over @ Diane's too and can't wait to give it a try. (I'm thinking graduation cards to start with.) How's the new job coming? I had to blog about Wordle (and you), so fun! Thanks for sharing something so fun and definitely "Blog Worthy". I am definitely going to have to try this. I have an idea for a layout and this will work well. Thanks for sharing it. I just went to this site and I love it. I am book marking so I can come back and print! Thanks for passing this on!